This sunny, spacious studio is situated across the road from the boat ramp leading to safe swimming at Oneroa Bay (we supply beach towels and 2 kayaks). A comfortable trundler bed is available for a child/friend if required for an extra $35. The studio is a short walk to Oneroa's cafes, restaurants and shops – and to art galleries, the wonderful Waiheke Cinema (seating on sofas) and Artworks Theatre. The accommodation is attached to the owners' house but has its own secure entrance and enjoys lovely views of the bay and the many boats that like to anchor here. The accommodation is particularly well appointed with a large (21 sq.m.) studio with queen size bed, sofa, dining table, a modern ensuite and walk-in wardrobe with iron, ironing board, extra blankets and beach towels. Tea and coffee making facilities, toaster, filtered water etc. all provided. Extra trundler bed available if required. We meet and drop off our guests at the ferry at Matiatia by arrangement. Only 6 minutes walk from Oneroa Villlage, Studio 33 is very well situated for popular wedding venues such as Mudbrick and Cable Bay Vineyard. There are many popular walks in this attractive area. Walking maps are provided. There is a private outdoor courtyard where you may sit under the pergola with a peep of the sea. Off street parking with boat parking also available by arrangement. Sustainable Living. A solar power system contributes to the electricity requirements of the house and the studio – day and night. What a lovely stylish + comfortable place. Delightful hosts, great views, and a lovely island. Tania + Robert SO hospitable. We've had a memorable visit. Thanks! Had an amazingly relaxing time. Wonderfully romantic location and lovely hosts. Will definitely come back! Thank you! Suitable for couples or singles. We have a rollaway bed so can accommodate a child/friend for an extra $35 per visit if required. I have now retired but enjoy meeting the many delightful guests that we have staying in our studio. 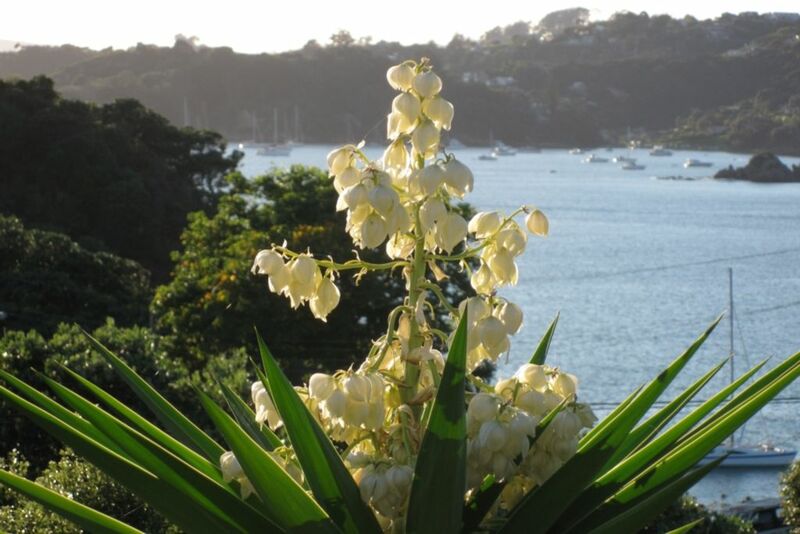 I am a keen gardener and also involved in some of the many activities on Waiheke Island. We enjoy walking and swimming at the beach across the road. It is well equipped, across the road from the beach and conveniently situated to the village, restaurants, cafes, etc. Although being close to everything as it is a dead-end road it is extremely quiet. Large, sunny room with beautiful views of Oneroa Bay. Peaceful and romantic. Well equipped and spacious roo. WiFi TV. 2 kayaks. Downtown is a 35 minute ferry ride away. The ocean is across the road. The village is 6 minutes walk from the studio. There is a view across the bay from the bed. Oneroa beach is across the road with safe swimming. There is a view of the bay and the ocean from the studio. The beach across the road leads to the Pacific Ocean. There is a view of the bay from the studio and from the bed. What a lovely place to stay, the unit was very modern and tidy. Close to town and restaurants. Only takes about 7 minutes to walk to town. Very comfortable with views out to the water. Spacious studio, very well maintained and with thoughtful and friendly hosts in Tania and Robert. Our second time here when visiting NZ from the UK and we'll plan on staying here again next time. Quiet and relaxing ... close to the village and beach! My husband and I were finishing up our 38-day tour 'down under' and this was the perfect place to rest and relax before our travels back to the USA. We spent 3 days walking the beach, visiting the wineries (there are so many!) and enjoying in the peaceful atmosphere. Studio 33 is a short walk from the beautiful beach. And a quick walk from the village of Oneroa. The owners were lovely and helpful. Gave us great ideas of things to do while on the island! I highly recommend! Beautiful property, ticked all the boxes. Thank you. The studio is situated across the road from a beautiful beach with safe swimming. There are views of the bay from the bed. There are also numerous beautiful walks of different lengths. Vineyards for wine tasting are within walking distance or there are wine tours. All classes of dining are within easy walking distance. Private sit-out area in the garden. Although close to all amenities the studio is very quiet and private. There is free Wi-fi and we meet our guests on arrival at the ferry.